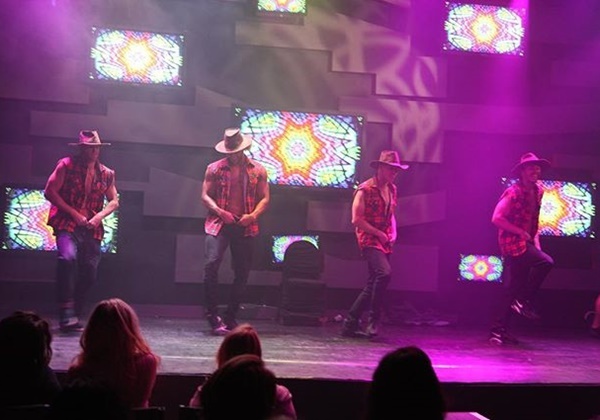 Aussie Heat is one of the steamiest male revue shows to hit the Vegas Strip. For the ultimate girl’s night out, head to Planet Hollywood Resort and Casino on South Las Vegas Boulevard for an entertainment experience you won’t soon forget. The show features a cast of chiseled hunks from down under who have just as much talent as they do muscles. This seductive dance crew first saw fame when they appeared on Australia’s Got Talent and later on So You Think You Can Dance Australia. Now you’ll find this group of attractive male performers in Sin City where they’ll bring your wildest fantasies to life. In early 2015, the men of Aussie Heat made the decision to take their performance to Sin City for an electrifying experience Las Vegas has yet to see. The all-star cast features some of the most talented performers in the country, including highly-skilled break dancers, poppers, and freestyle hip hop dancers. The group first performed in July of 2015 in the D Hotel Showroom at Freemont St for a 7 show per week contractual residency. Soon enough, word spread about the talented dance. Today, Aussie Heat is on its way to becoming the #1 rated Adult Show in Las Vegas. The entertainment starts the minute you arrive to the show. Before you even make it into the theater, you’ll have the opportunity to grab a stack of ‘Hunk Bucks’. You can use these bucks throughout the show to flag down the group of guys. Aussie Heat is the perfect place to go with a group of ladies, whether you’re celebrating a bachelorette party, divorce party, girl’s night out, or nearly any other occasion. Ladies must be at least 18 years of age or older to enjoy the show. Originally known as Aussie Hunks, the show continues to revamp year after year to make it bigger and better than the year prior. This ensures that with every visit, you’re going to see something you haven’t seen before. The only thing that doesn’t change is the group of eight classically-trained professional dancers derived from Australia. The show is performed using a high-energy soundtrack of pop music that allows the dancers to show off their hip-hop and street dancing style while incorporating sensual dances and strip teases to impress the female audience. Along with elaborate lighting and props, Aussie Heat makes for an entertaining show from start to finish. Take your fantasies to the next level when you get a ticket to see Aussie Heat. From their irresistible charm to their sensual dance moves, you’ll be intrigued from the moment the guys walk on stage. Of course, the men also have authentic Aussie accents that will make you melt. There’s really nothing sexier than a guy who can dance and dance well. Don’t waste your time or money on inferior male revue shows when Aussie Heat is the hottest new show on the Strip. Grab a group of your closest friends and experience the heat for yourself.